Matt Richardson broke his ankle celebrating a goal and instead of going immediately to the hospital, waited at the end of the game to see his team win. It happened during the Championship match on Saturday. They faced Leeds and Sheffield Wednesday, two historical teams. And the stadium was filled. The Leeds fans, as usual, came en masse to support their team. But one of the fans suffered a mishap while the game was played. The match was tied to zero when, in the 65th minute, Jack Harrison scored for the home team. 1-0 and the fans kept jumping to celebrate. However, that celebration turned out to face a follower, Matt Richardson, as explained on social networks. 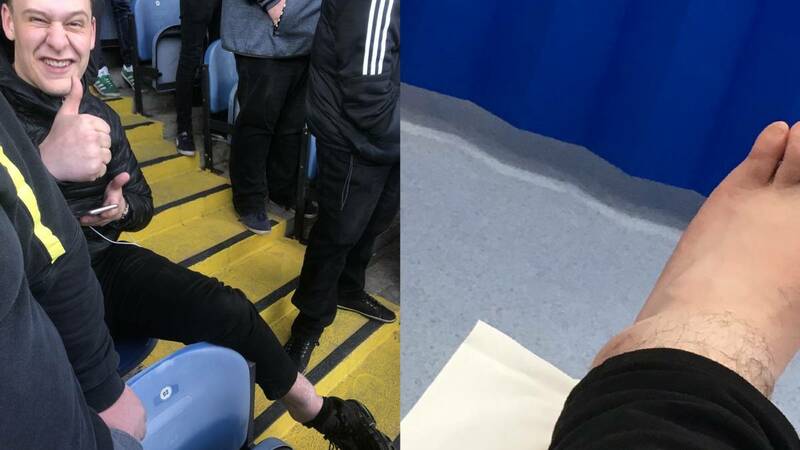 The Leeds supporter broke his ankle during the celebration of the goal and waited for the game to end as if nothing had it would have happened: "You seemed to be in a good mood, friend" , they commented on a photo where you could see the swollen foot while he smiled with his thumb up. Later, with the meeting already finished, Matt shared Another photo of his foot in the hospital explaining that it did not matter his accident, but that Leeds had achieved the victory to remain second in the standings: "For this is what I'm worth supporting Leeds." Harrison marks and ended up breaking the ankle while I celebrate, now, sitting in the hospital waiting for the operation, but I do not care, we won ".